9.1Will computers be used more than books in the future? 9.2Will books be replaced by the Internet? 11.1He's the boy who won the photo competition last year! 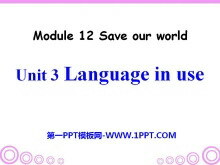 《Language in use》Save our world PPT课件2 objective: To summarize and consolidate the rules of word building Observe Observe the following sentences carefully. 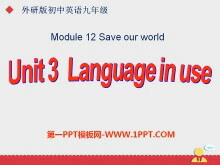 They are all from this module. 1. 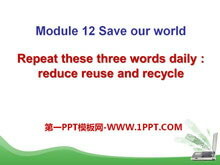 Reuse meansu..
《Language in use》Save our world PPT课件 Teaching aims: 知识目标：To master some words and expressions about save our world: factory pollute recycle waste enemy crop kill oil less such as hopeless 能力目标..
《Repeat these three words daily:reduce reuse and recycle》Save our world PPT课件3 Words Review china n. 瓷；瓷器 divide v. 分开 plastic n. 塑料 adj. 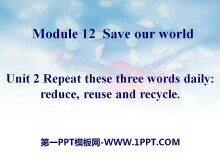 塑料的 policy n. 政策；方针 reuse v. 再次使用；重复利用 bott..
《Repeat these three words daily:reduce reuse and recycle》Save our world PPT课件2 Learning Aims 1.Knowledge aims 1) To learn something about protecting the environment. 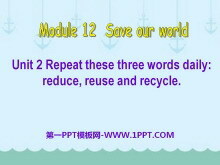 2)To know more about the ways to save th..
《Repeat these three words daily:reduce reuse and recycle》Save our world PPT课件 Linglings homework Reduce meansuse less. Reuse meansuse again. 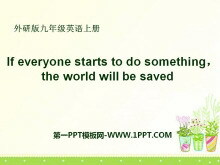 Recycle meanschange things into something else to be reused.. Whi..
《If everyone starts to do something，the world will be saved》Save our world PPT课件3 Listen and complete the sentences 1. The factory is causing a lot of _____. 2. 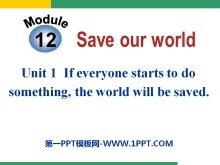 There should be some ____to stop the polluti..
《If everyone starts to do something，the world will be saved》Save our world PPT课件2 Warming up What can you see? We can see that rubbish is being burnt. The smoke goes into the air. 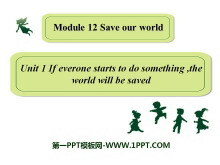 It is causing air polluti..
《If everyone starts to do something，the world will be saved》Save our world PPT课件 Warm up Talk about the pictures. New words and expressions /'fktr/ 制造厂；工厂 n. factory /p'lu:t/ 污染 v. pollute /ri:'..
《Language in use》Photos PPT课件3 objectives 1. To understand and apply the attributive clause with which and who 2. 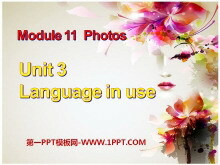 To practise and apply new vocabulary 3. 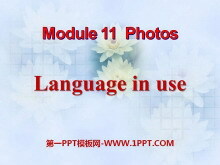 To complete a task involving making a photo show ..
《Language in use》Photos PPT课件2 The Attributive Clause 定语从句 Can you guess ? 1.He is a Chinese basketball player who/that was born in Shanghai. 2.It is something that can keep you warm when you sleep. 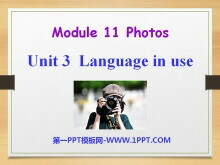 ..
《Language in use》Photos PPT课件 Language practice Hes the boy who won the photo competition last year! The photo which we liked best in the City and People group was taken by Zhao Min. A group of photos which..
《The photo which we liked best was taken by Zhao Min》Photos PPT课件3 Warming up Look at the picture and say out the subjects of the photo competition. Which subject does this photo belong to? New words winner..